If this adventure book was an old school metal release from the 80s, on some creaky little independent label it would be one of those quirky split singles, were two bands would each have a side of the vinyl record. On Side A is The Furnace. The first convention adventure that I ran when I decided to run an Old School D&D adventure, initially using Labyrinth Lord, and was named after the convention it was run at, namely, Furnace which is held every October in Sheffield UK. 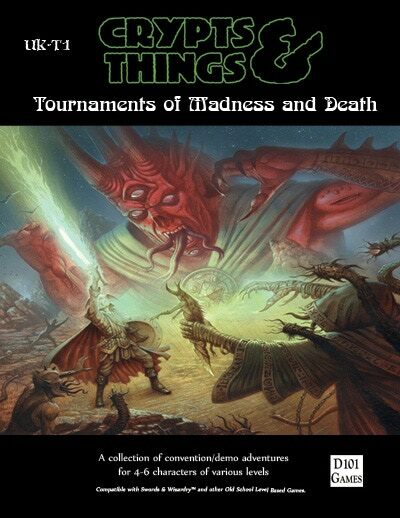 I ran it on Saturday night, which is now my annual slot for running OSR games, and despite the naysayers at the bar beforehand, who seemed threatened by my decision to run a game using a system they had left behind years ago, and the my own almost paralysing bout stage fright we had a fantastic time. It was at this point I decided that it was well worth my time returning to the games of my formative years in the hobby. The precise details of the scenario have changed with time, and it’s a more compact and polished-up Crypts and Things write up that is presented here. Tearing up side B is The Tomb of the Evil Emperor. This was one of my final outings with Crypts and Things as a convention game in my first phase of running the game at conventions, just after the release of the game in 2012. A slightly boozy game at Continuum, a summer affair held bi-annually at Leicester University, which saw the bold adventurers race across the ruins of the Grand Debris, through the buried Imperial Complex, to a final confrontation with the shocking surprise of the true form of the Evil Emperor. Two sides of the Crypts & Things convention experience. Madness both in the sense that the locations that make up the adventures aren’t your typical garden dungeon. The Furnace takes place on an artificial iron moon held up in the sky by magic, while Tomb is in a city crushed by a vengeful god using a meteor. Death because it was what faced the doomed world of Zarth if the adventurers failed in their mission to stop the Ultimate Evil that threatened the world, and because it was a genuine possibility given the cast of horrors they faced. All “good friendly violent fun in store for all” as the thrash metal band Exodus once sang on their song Toxic Waltz. Finally Dark, Delicious and Deadly is an insert, cunningly placed between the two adventures, that explains the method behind the madness about how I run convention games of Crypts and Things. For 3-6 characters levels 4th-5th, explicitly written for Crypts and Things but usable with a host of retro-clones based on the early editions of the Worlds Favourite Fantasy Game, and heck even the modern 3rd to 5th Editions if you can be bothered to put the work in adapting the monster blocks. ETA Sometime in July, pre-order soon. This entry was posted in Crypts & Things, Fiendish Friday by Newt. Bookmark the permalink.